Sea World is my absolute favorite theme park. When I was younger, I used to spend most of my days hanging out at the dolphin tanks. I had been there almost every year while growing up and even skipped senior picture day to cavort with these majestic sea creatures. My honeymoon was spent guess where? Yup among the smartest mammals alive! I cried during the dolphin show just from the sheer beauty of watching them…and I was an emotional wreck from marital bliss. So you know when it was time to bring my boys to my favorite park for the first time, I was more excited than they were. We met Tara, my friend from Global Resort Homes, the vacation home we stayed at while visiting Kissimmee. She joined us at Sea World to show us how to play games with dolphins. She spends a lot of her time here because she is fortunate enough to live so close. Since she is so awesome, she shared the little known secret of how to play with the dolphins! Check out the video. I thought it was really neat to learn that the bottlenose dolphin population at Sea World were actually born right in the park, and that most of those dolphins went on to breed successfully. This let Sea World become the world’s leaders in dolphin reproduction and related studies. 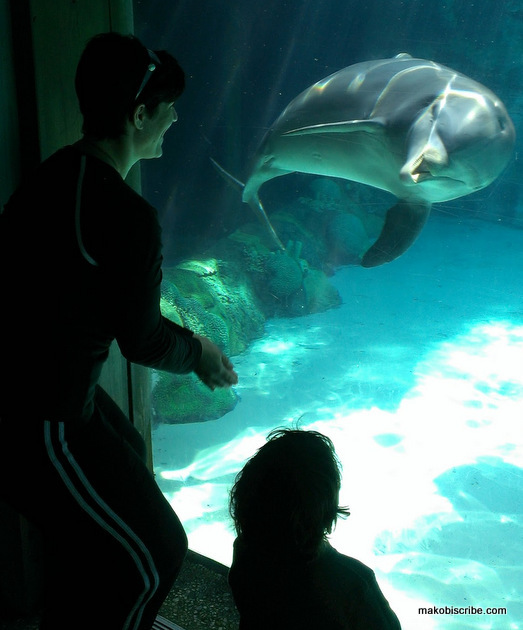 You can find out how to play with the Bottlenose Dolphins at Sea World at Dolphin Cove or the Dolphin Nursery. They have trainers that help you feed and touch bottlenose dolphins up close and by hand. Want to get even closer? Sign up for the unforgettable Dolphins Up-Close Tour. You won’t regret it. I know that will be one of the things we will do with my kids when they are old enough. Basically, dolphins are playful creatures. They will interact with you if you can catch their attention. Tara took her keys from her pocket and threw them up and down in a rhythmic manner while the dolphin followed the keys with his head. This completely amazed my toddler, Mason, and shortly after he tried to emulate it with Daddy’s keys. Pretty soon, all of the fellow viewers gathered around watching! Many dolphins became interested and they took turns playing with Tara. I really enjoyed interacting with the dolphins under the glass as opposed to the open tank above. With squirmy toddlers and smelly fish, not to mention the lines; this manner worked perfectly for my family. I felt we had a personal, one on one experience that I was thrilled to catch on film. 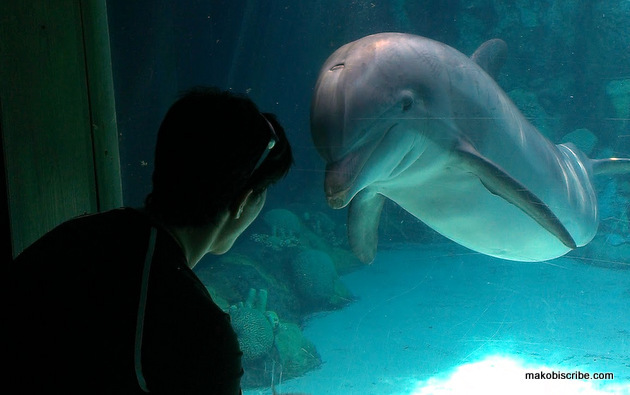 Have you ever played with the dolphins at Sea World? What did you do? *a huge thank you to SeaWorld for providing my family tickets to see the park. Make sure to stay turned for upcoming posts on our SeaWorld adventures, including the SeaWorld’s Christmas Celebration. You can see all my post from our wonderful Kissimmee Vacation where I guest blogged at i.see.Kissimmee. We really enjoyed attending Sea World last March. I’m hoping that we’ll get to go back again soon! I miss Ohio’s Sea World so much! My family used to go there every year when I was a kid, at least we did until they closed it down. That is so neat. I love dolphins so this would be amazing to me. It looks like you all must have had a great time at Sea World!